The crisis facing the U.S. economy permeated all sectors of the mainstream press. Newspapers, network and cable television, radio news and news websites all devoted more than a quarter of their newshole on economy-related subjects in the period from February 1-July 3. However, as is often the case with major stories, where news consumers went for information made a difference. Media sectors and outlets not only differed in the level of economic coverage, they also diverged when it came to what aspects of the crisis they focused on. Newspaper front pages stood out for devoting the most attention to the economy, offering more localized coverage, giving voice to a more diverse range of sources and producing a higher level of enterprise reporting than other media sectors. The network evening newscasts distinguished themselves by focusing on the recession’s impact on the lives of average Americans, with all three major commercial networks airing regular features on the subject. Cable television and talk radio, two platforms that rely more than others on ideologically driven debate, focused more on the Beltway-based political aspects of the economy, such as the stimulus package battle. And in both sectors, overall coverage of the economy plunged dramatically when the story became less Washington-centric. The newspaper sector consistently devoted the most attention to the economic crisis. More than a third (37%) of the national and international coverage on newspaper front pages was devoted to economy-related issues from February into early July. That was significantly more than any other sector. Websites were next with 30% of their top coverage, followed by network television at 29%, cable television at 28%, and radio at 27%. These findings echo those in an August 2008 PEJ study released called “Tracking the Economic Slowdown,” which found newspapers producing the most economic coverage in the months leading up to the fall 2008 meltdown. Newspaper coverage also relied on a wider range of sources than the media overall. For instance, local government officials were more likely to appear in print stories than elsewhere (29% vs. 12% in the media generally). So were ordinary citizens (29% of print stories quoted them vs. 19% overall). And the same was true for interest groups (14% of print stories vs. 6% overall) and labor unions (5% vs. 2%). Newspapers also demonstrated more enterprise in how they covered the economy than other media did. More than a third (35%) of the newspaper stories about the economy were investigative or enterprise, meaning that journalists initiated the report rather than it being based on some external event. No other media sector came close, as 20% of network television stories, 13% of online stories, 10% of radio stories, and 8% of cable stories were of a similar nature. Some of these stories included reports about trends, such as a March 26 piece in the Los Angeles Times about recently laid off middle-class workers unable to qualify for social aid. Others were more investigative, such as an April 12 story in the San Jose Mercury News about public officials who received large payouts for unused sick and vacation time when they retired. The practice, as determined by the paper’s investigation, cost the city of San Jose, Calif., $7.8 million in 2008. Another way that newspapers differed in their coverage was in the breakdown of economic storylines. 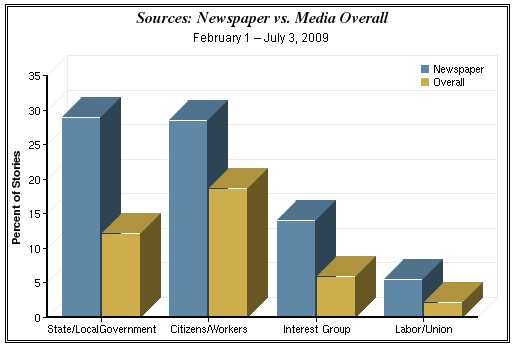 Papers focused on the impact of the economic crisis on state and local governments (11% of the economic newshole) more than three times as much as any other media sector. In part, this is a function of the fact that most newspapers in the United States are local and essentially community oriented. But that difference in economic model, one challenged in the current media climate, has an impact on coverage. For example, the Herald News in Fall River, Mass., had a March 3 front-page story on how the city was going to have to lay off 149 workers to offset $2.9 million in state aid cuts for the year. Three days later, the Kansas City Star reported on a proposal by Mayor Mark Funkhouser that would include the layoff of 100 middle managers. Newspapers also devoted considerably more coverage than any other sector to reporting on how specific businesses or industries not connected to the financial sector—both large and small—were faring in the economic downturn. Those types of stories filled 8% of front-page newspaper economic coverage compared with 4% online, 3% on radio and network television, and 2% for cable. That included a March 16 report by the Los Angeles Times on how the L.A.-based Getty Trust fund, the “economic Goliath of the museum world,” was going to have to cut its budget by 25% in the upcoming year due to investment loses. An April 15 report in the Spokesman-Review of Spokane, Wash., found a local medical center that was preparing to eliminate 90 jobs due to a decline in elective surgeries because of the recession. Although smaller papers devoted a higher proportion of coverage to the recession’s impact on state and local government and non-banking businesses, bigger dailies also pursued these angles more aggressively than the media overall. The New York Times, arguably one of the nation’s few national papers, devoted 7% of its front-page economic newshole to the effect on state and local government and 6% to businesses not tied to the financial industry. News coverage on the three major commercial broadcast networks stood out for its emphasis on the impact of the economic crisis on ordinary citizens. That focus on average citizens was considerably higher on nightly newscasts, where it filled 12% of the economic newshole studied, than on morning shows (5%). All three of the network evening broadcasts included regular features on how the recession affected families and individuals. The NBC Nightly News aired “Making a Difference,” which highlighted people doing charitable work during the recession. On March 19, for example, the show reported on a movie theater outside of Charlotte, N.C., that offered free weekly showings of popular movies. ABC News’ World News Tonight had a segment called “A Closer Look” that often focused on the impact of the recession on families. On June 30, that included a report that American households had lost a combined total of $6.4 trillion since the financial crisis began and explained how many families were cutting back in order to manage. The CBS Evening News aired a series called “Children of the Recession” that included a May 21 profile of an 11-year-old homeless boy named Tristen who was grateful to stay in a motel, rather than on the street. The focus on the impact of the financial crisis on ordinary citizens was also reflected by the degree to which the network stories, both morning and evening newscasts, included the voices of citizens and workers. Ordinary people appeared as sources in 31% of stories — more than any other sector and far exceeding the 19% of stories in the media overall. Within the network sector itself, however, there were notable differences between morning news (Good Morning America, The Today Show, and The Early Show) and evening news. The morning shows generally covered the economy less (24% of the airtime studied in their first half hour)—the smallest number of any media platform studied other than liberal talk radio hosts. Evening news devoted 30% of its airtime to the recession. Morning news was more focused on the banking bailout, (21% of the economic coverage vs. 13% on network evening). The Bernard Madoff scandal, housing crisis, the stimulus plan, and reports about the stock market all received more attention on morning news than on evening news as well. Evening news, conversely, was focused more on the financial troubles and plant closings related to the U.S. auto industry (13%), the impact of the crisis on average Americans (12%), and reports about jobs and unemployment (6%). The PBS NewsHour with Jim Lehrer stood apart in various ways. Fully 37% of the NewsHour’s coverage was economy-related, compared with 27% of the commercial networks overall and 30% for their evening newscasts. In particular, the NewsHour paid more attention to the issue of jobs and unemployment than most other news sources. About 10% of its economic coverage was about jobs, compared with 6% for the media overall and 6% for commercial evening network news. During the period of June 1 through July 3, when unemployment proved to be worse than the administration had predicted, fully 19% of NewsHour’s economic coverage was about the topic. That was almost three times as much as the 7% the media overall devoted to the issue during the same time. Meanwhile, cable’s treatment of the economic downturn appeared to mirror a pattern that has emerged consistently in PEJ’s analysis of mainstream media coverage. The cable sector, which includes opinion-driven prime-time talk shows, tended to focus on more politically polarizing subjects, while paying comparatively less attention to other events and themes. Cable devoted 26% of its overall economic newshole to the heated partisan Washington-based battle over the Obama administration’s stimulus package—almost double the total for the media overall. At the peak of the stimulus battle in February, cable devoted more than half (58%) of its newshole to the issue, far more than any other sector. Some of that coverage consisted of having guests with opposing views debate the value of the stimulus plan. Consider the February 12 edition of MSNBC’s Hardball, for example, when Republican Brian Bilbray and Democrat Debbie Wasserman Schultz debated the merits of the package. Another tendency in cable was to have the host propagate his or her single view, with the Venus vs. Mars debate occurring on different channels across different days. Cable also devoted the highest percentage of coverage to two other hot-button topics related to the economy—outrage over the bonuses received by executives at the insurance giant AIG (8%) and coverage of Obama’s proposed budget along with concerns over the federal deficit (8%). Cable’s attention to the budget story was nearly twice that of any other media sector. Cable’s Beltway orientation was also reflected in the fact that it had the highest percentage of stories triggered by government action (56%). At the same time, cable devoted the least amount of time to stories about the financial troubles of the auto industry, unemployment and jobs, the impact of the economic crisis on average Americans, and housing when compared with the other media sectors. And although all the media sectors saw a major drop-off in economic coverage from March to April, the decline in cable coverage was the most dramatic. In March, cable filled 50% of its overall newshole with economic-related stories. In April that dropped by about two-thirds, to 18%. In the media overall, coverage declined from 47% in March to 24 % in April, a drop of about 50%, but not as drastic as the decline in cable. That reflects, in part, a cable news culture constantly on the lookout for the next explosive story to dominate the airwaves—and by early spring, the economy was starting to wear out its welcome. Online, coverage of the economy was similar to the press overall. The study includes analysis of the top stories on the 12 most popular news websites in the country. There, 30% of the leading news coverage on Web sites was economy-related, very close to the 31% in the overall press. The web differed in some small ways from the media overall. For one thing, online media outlets followed the auto industry most closely, devoting 16% of its top coverage of the economy to the subject, vs. 12% overall, more than any other sector. One website stood out in particular, in part perhaps because of the economic basis of its parent company. Reuters.com is a general interest news site, but the British-based news service derives most of its revenue from covering financial news for business clients. Reuters.com was the media outlet studied by PEJ that devoted the largest percentage of its coverage to the economy. About two-thirds of Reuters’ leading news coverage from February till early July was economy-related, more than double the level in the media overall. A significant portion of the economic coverage on Reuters.com was focused on two major topics—the bailout of the banking industry (at 24% of the economy coverage) and the financial troubles facing the U.S. auto industry (at 17%). Together, those two topics made up 40% of Reuters’ economic newshole. At the same time, Reuters devoted a small percentage of time to the stimulus bill; only 2% of their economic coverage was about that topic, compared with 14% for the media overall. Coverage of the economy varied on radio depending on the type of program. PEJ’s radio sector includes the hourly headline news reports from ABC and CBS, National Public Radio’s signature morning news program, Morning Edition, and a sampling of ideological commercial talk hosts from the left and the right. In terms of overall coverage, the headline newscasts and Morning Edition were similar—each devoted 30% of the airtime studied to the economic crisis. But there were differences in emphasis. One distinguishing characteristic of the network headline reports was its emphasis on the employment picture, which accounted for 12% of its coverage, about twice the level in the media overall. Morning Edition stood out in other areas. The program paid relatively little attention (2% of overall economic newshole) to the impact on average Americans. Conversely, the program gave more attention (6%) to how the U.S. economic crisis was affecting foreign economies, more than any other broadcast outlet. On talk radio, meanwhile, a quarter of the coverage was about the economy. Except for morning network television, talk radio devoted the least amount of attention to the subject of all media sectors. And there was a clear difference in attention between liberal talkers Ed Schultz, Randi Rhodes and Stephanie Miller and their conservative counterparts, Rush Limbaugh, Sean Hannity and Michael Savage. The conservatives filled 29% of their airtime with discussion of the economy compared with only 19% for liberals. And as was the case with cable coverage, as the story became less Washington-focused and there were fewer partisan debates, attention on talk radio plunged. In February, fully 46% of the talk radio agenda was filled with news of the economy. In April, the level of attention had fallen to 17%.